Carpet factory is a proud supplier of Godfrey Hirst Carpets. Godfrey Hirst is Australias largest manufacturer of wool and synthetic carpets. All carpets manufactured by Godfrey Hirst come fully back ed by the full Godfrey Hirst customer warranty. Carpet Factory stock full rolls of Godfrey Hirst carpets in store. We bulk buy our Godfrey Hirst carpets and keep stock to maintain the most competetive prices. With full sized rolls in stock you can see exactly how your carpet will appear in large full length rolls. No more guessing from small sample boards. Come in to Carpet Factory today to see exactly how your carpet will appear in the full broad loom roll width. 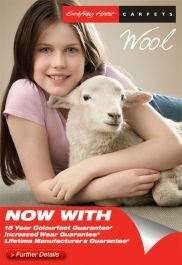 Godfrey hirst has now initiated their spf 15 sun protection rating on their best wool and synthetic carpets. Think of SPF as a long lasting sunscreen that is built into the carpet and doesn’t wear off. This gives you confidence to open up your home and let the sun shine in! The SPF 15 Year guarantee applies to selected Residential Extra Heavy Duty (REHD) nylon carpets as rated by the Australian Carpet Classification Scheme (A.C.C.S).